Fans of the band The Killers are jumping with joy at the announcement that Brandon Flowers, the lead singer of the band The Killers, is out on a solo tour and will also appear at several music festivals. The Killers is a very popular band and a good reason for that is their handsome and talented frontman Brandon Flowers. Not only does the band have a whole slew of popular songs, Brandon Flowers solo is no slouch either. In fact, he alone has a huge following, just as his band does. His latest album ‘The Desired Effect‘ has become hugely popular with his fans and debuted at Number One on the music charts. This is actually his second solo album that hit the open market at the number one spot. His concert tour is not huge and there are about 12 live shows planned as part of his tour schedule so far. Hopefully, for fans sake, Brandon Flowers will be adding more concert dates to his already announced tour. 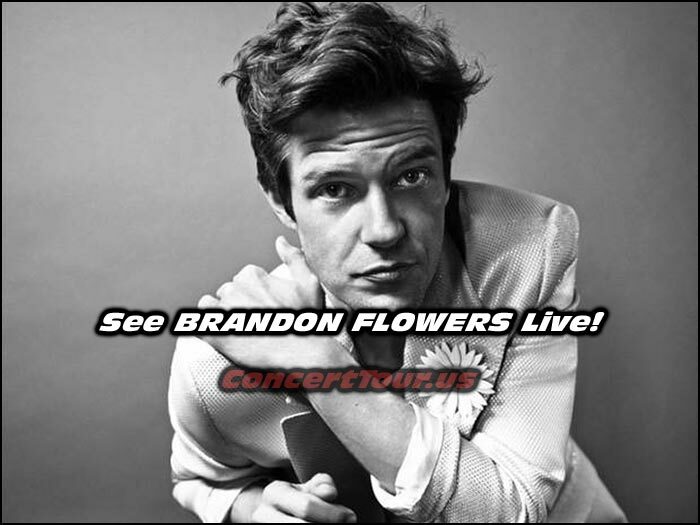 Look Below for the latest list of Brandon Flowers tour dates, links to look for Brandon Flowers concert tickets, plus some music videos by Brandon Flowers and The Killers. Brandon Flowers performs an intimate session exclusively for Absolute Radio. Including the tracks ‘Crossfire’, ‘Can’t Deny My Love’, ‘Lonely Town’ and the Killers classic ‘Read My Mind’. Brandon Flowers of the band The Killers plans out small 2015 fall Concert Tour! Brandon Flowers (and his band The Killers) are so popular that we urge you to try to get your tickets as early as possible. Try all pre-sales and also try the general public on-sale. You can also check for tickets above.